Screening aims to find breast cancers early, when they have the best chance of being cured. Cancer screening involves testing apparently healthy people for signs that could show that a cancer is developing. Breast screening uses a test called mammography which involves taking x-rays of the breasts. Screening can help to find breast cancers early, when they are too small to see or feel. These tiny breast cancers are usually easier to treat than larger ones. Overall, the breast screening programme finds cancer in about 8 out of every 1,000 women having screening. Each year more than 2 million women have breast cancer screening in the UK. The NHS Breast Screening Programme invites all women aged between 50 and 70 for screening every 3 years. You need to be registered with a GP to receive the invitations. In some parts of England, the screening programme has been inviting women from 47 to 73 years old as part of a trial. If you are older than 70, you can still have screening every 3 years but you won't automatically be invited. To make an appointment, talk to your GP or your local breast screening unit. If you are younger than 50, your risk of breast cancer is generally very low. Mammograms are more difficult to read in younger women because their breast tissue is denser. So the patterns on the mammogram don't show up as well. There is little evidence to show that regular mammograms for women below the screening age would reduce deaths from breast cancer. Breast screening is also for transgender people, talk to your GP if you haven't been invited for screening. 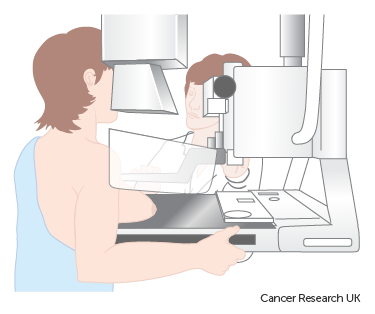 Breast screening takes 2 x-rays of each breast. The x-rays are called mammograms. You have one mammogram from above and one from the side on each breast. You should get your results within 2 weeks. The radiographer can tell you when to expect yours. Most women have a normal reading. If the x-ray isn't clear enough or shows any abnormal areas, the clinic staff will call you back for more tests. You might need to have the x-rays taken again. Around 7 out of 100 women (7%) are called back after their first screening test. If this happens, you might feel very worried. But many of these women won't have cancer. Around 3 out of 100 women (3%) are called back after further screening tests. If you are called back because your mammogram showed an abnormal area, you might have a magnified mammogram. This can show up particular areas of the breasts more clearly. These mammograms show the borders of any lump or thickened area. They can also show up areas of calcium (calcification). You might also have an ultrasound scan of the breast or tests to take a sample of cells from the abnormal area. Breast cancers found by screening are generally at an early stage. Very early breast cancers are usually easier to treat, may need less treatment, and are more likely to be cured. The current evidence suggests that breast screening reduces the number of deaths from breast cancer by about 1,300 a year in the UK. Almost all women diagnosed with breast cancer at the earliest possible stage survive for at least 5 years after diagnosis and are likely to be cured. Although breast screening can find many cancers early it isn't perfect. There are some risks. Screening doesn't always find a cancer that is there. So some people with breast cancer will be missed. This is called a false negative result. In some women, the test picks up something even though they don't have breast cancer. This is called a false positive result and can lead to anxiety and further tests such as a breast biopsy. As well as finding cancers that need treating, screening can also pick up breast cancers that won't ever cause any problems. At the moment it isn't possible to know whether a breast cancer will grow quickly and need treatment, or will grow slowly, or not at all. So, almost all women diagnosed have surgery to remove the cancer. Many also have radiotherapy, hormone therapy or chemotherapy. For some women the treatment is unnecessary but at the moment doctors can't tell who needs treatment and who doesn't. Screening can also pick up changes in the lining of the breast ducts called ductal carcinoma in situ (DCIS). It isn't possible to tell whether DCIS will develop into a cancer or not. So, many women with DCIS also have surgery and radiotherapy or hormone therapy. A breast screening review in 2012 found that screening leads to around 4,000 women overdiagnosed in the UK each year. Each mammogram exposes a woman to small amounts of radiation from the x-rays. But the amount of radiation is very small. If 10,000 women have regular 3 yearly breast screening between the ages of 47 and 73, there will be between 3 and 6 extra breast cancers caused by radiation. More than 18,000 breast cancers are diagnosed through screening in England each year. Most of these are found at an early stage when the chance of successful treatment is high. You can have screening from a younger age if you have a higher than average risk of breast cancer. This might be due to a family history or an inherited faulty gene. Speak to your GP if you think you might be at increased risk. They can refer you to a genetic specialist, who can assess your risk. Not everyone with a family history of cancer is at increased risk themselves. UK guidelines recommend that women with a moderate or high risk of breast cancer because of their family history should start having screening mammograms every year in their forties. If you are younger than 40 and have an increased risk of breast cancer, you should be offered yearly MRI scans from the age of 30 or 40. This depends on your level of risk. If you have had tests that showed a change in a gene (mutation) that increases the risk of breast cancer, the recommendations are slightly different. Should I go for breast screening? It’s important that you have access to enough information about the benefits and harms of breast screening to make the decision. You can talk to your own doctor or nurse. Or you can contact the Cancer Research UK nurses on freephone 0808 800 4040. The lines are open from 9am to 5pm, Monday to Friday. Even if you are having mammograms every 3 years it is important to make sure that you know how your breasts normally look and feel. Many breast cancers are still found by women themselves. Cancers can develop between mammograms. This is known as an interval cancer. Mammograms can also miss some cancers. If you notice any unusual changes in your breast don’t wait until your next mammogram. See your GP straight away. The information on this page is based on literature searches and specialist checking. We used many references and there are too many to list here. If you need additional references for this information please contact patientinformation@cancer.org.uk with details of the particular issue you are interested in.